Oil and Gas News Category Archives — Page 2 of 9 — Texas Oil and Gas Attorney Blog Published by Texas Oil and Gas Lawyer — Aimee Hess P.C. A recent study on emissions related to U.S. natural gas transmission and storage operations by the Energy Institute of Colorado State University found that total emissions were 27.5% lower than emissions calculated by the U.S. Environmental Protection Agency’s 2012 Greenhouse Gas Inventory. The study estimated the methane emissions from natural gas transmission and storage operations in the United States by evaluating data collected during 2012 including 2,292 on-site measurements, emissions data from 677 facilities, and activity data from 922 facilities. The report estimates that total methane emissions from transportation and storage is 1,503 Gigagrams/yr with a confidence interval of 1,220 to 1,950 Gigagrams/yr. The EPA’s Greenhouse Gas Inventory estimate is 2,071 Gigagrams/yr with a confidence interval of 1,680 to 2,690 Gigagrams/yr. The EPA Greenhouse Gas Inventory estimates an overall methane loss rate of 6.2 Tetragrams/yr which is approximately 1.3% of all methane transported in the U.S. 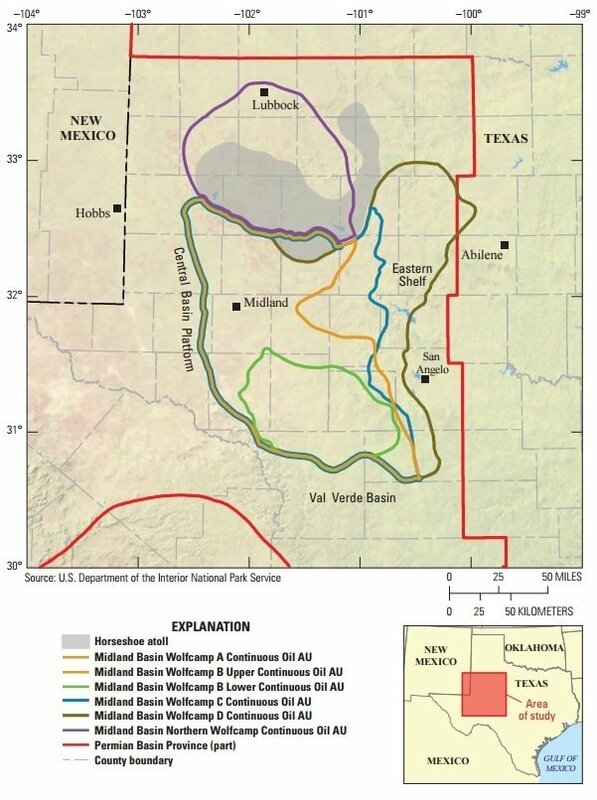 The United States Geological Survey (“USGS”) has just announced the assessment of this country’s largest oil and gas shale deposit located in Texas. You can review a copy of the actual assessment here. The area where the deposit is located is known as the Wolfcamp shale contains 20 billion barrels of oil and 16 trillion cubic feet of natural gas. That is Almost three times more petroleum than found in North Dakota’s Bakken shale in 2013. 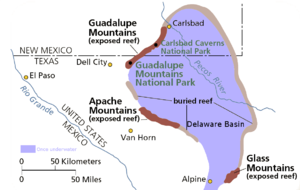 As can be seen in the map shown here, this deposit covers a wide swath of West Texas. In addition, Apache Corporation recently announced that it has found billions of barrels of oil in West Texast, in an area it has called Alpine High. 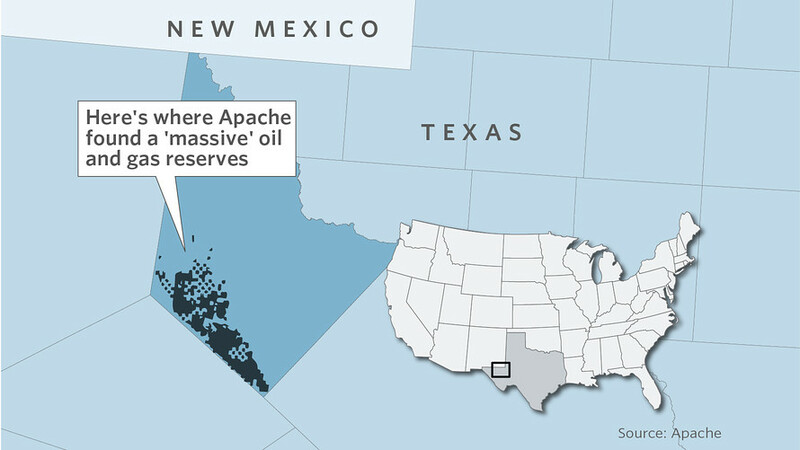 Apache estimated that this area region holds about 3 billion barrels of oil and 75 trillion cubic feet of natural gas. Alpine High is located in the Delaware Basin, which is a sub-basin in the southwest corner of the Permian Basin. 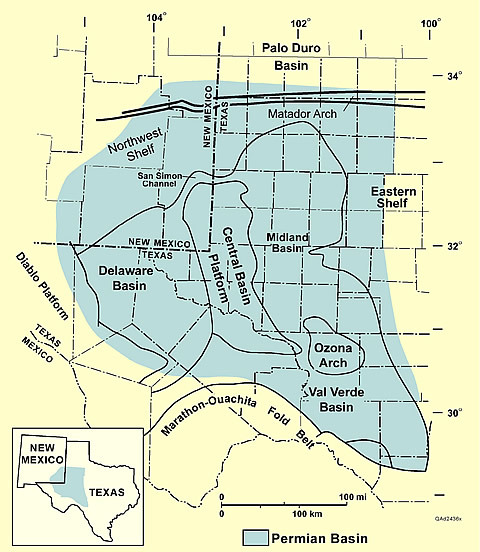 The Permian itself is mostly located in west Texas, with a small area straddling southeastern New Mexico. as can be seen in the map below, Alpine High is located to the West of the reserves announced by the USGS. In September 2016, Oklahoma experienced a 5.6-magnitude earthquake near the town of Pawnee. The quake was the first in a series that started on the morning of Saturday September 3, 2016. While no one was severely hurt or killed during the earthquake, somey buildings suffered moderate to severe damage. The quake was the second largest in Oklahoma history and was felt as far away as Chicago and Austin, Texas. After the 5.6 magnitude earthquake struck in the morning, several smaller earthquakes occurred weighing in at magnitudes of 3.6, 3.4 and 2.9, according to an article in The New York Times. One prominent theory for the cause of these quakes in states such as Oklahoma and Texas is that these earthquakes are the result of high pressure injection of wastewater from fracing into wastewater disposal wells. The theory is that wastewater is injected into the ground under such high pressure that the wastewater is able to percolate between the rocks in the ground and can act as a lubricant allowing stressed fault lines to slip. The sudden release of pressure from slipping fault lines then causes earthquakes, or so the theory goes. The Oklahoma Corporation Commission, which is the Oklahoma agency that regulates oil and gas production activities within that state, ordered more than three dozen wastewater disposal wells within five hundred square miles around where the earthquake occurred to be shut down, even though the United States Geological Survey (USGS) could not attribute the earthquakes to wastewater injection well activity in the area. In what is good news for royalty owners and mineral owners in the Permian Basin in Texas, the Energy Information Administration (“EIA”) recently issued a Drilling Productivity Report that projects that output from the Permian Basin will increase by almost 3000 barrels of oil per day. The Permian Basin is located in West Texas and southeastern New Mexico and includes Andrews, Borden, Ector, Loving, Midland, Pecos, Ward and Winkler Counties. The increase in production is probably the result of not only new wells, but also greater efficiency in drilling operations. In rereading a news release issued by the United States Attorney for the Eastern District of Kentucky, I was struck again by how much money is taken in by oil and gas scam artists. The news release recounted that a California man named John G. Westine, Jr. was convicted of 26 counts of mail fraud and a count each of conspiracy to launder funds and securities fraud. This scam had all the usual hallmarks of a fraud. First, he targeted people in a state other than where he resided. This makes it harder for defrauded investors to track him down. Secondly, he guaranteed returns to his investors. Nobody in the oil and gas industry who is legitimate will ever guarantee returns. Third, Westine created a number of bogus oil companies who “owned” a number of producing oil wells. He offered people shares in these oil wells and guaranteed royalties to the investors. He scammed 200 people out of more than $3 million! Of course, the investors funds didn’t go to purchase shares in oil wells. Instead, Westine and his half-brother were living the high life in California. The U.S. Postal Inspectors, who initiated the investigation into this scam, seized four of his vehicles in the Los Angeles area. One was a Mercedes Benz and the other three were Bentleys. Earlier this week, the Securities and Exchange Commission (SEC) sued Chris Faulkner, his company, Breitling Energy Corporation and several other parties for defrauding investors. The complaint filed by the SEC can be reviewed here. The SEC Complaint alleges that the Defendants intentionally and repeatedly misled purchasers of working interests regarding Faulkner’s experience in the oil and gas industry, the nature of the investment, and the estimated cost to drill and complete the intended wells. A working interest, unlike a royalty interest, is a type of mineral interest that bears a proportionate share of all exploration, drilling and completion expenses. Thus, an accurate estimate of the potential costs is critical information for an investor considering the purchase of a working interest. If costs are inflated over actual costs and the operator pockets the difference, obviously that’s a problem. Whether Faulkner and the other Defendants are adjudged guilty of these allegation remains to be seen, of course. However, these kinds of claims emphasize the need to have an experienced oil and gas attorney examine and evaluate any potential oil and gas investment before you invest. An experienced oil and gas attorney will review your goals for the investment, discuss the suitability of the investment with you, review and analyze all offering circulars, contracts and other documents, and possibly most important, conduct due diligence background research on the company with whom you are investing.